It is beyond the scope of this modest blog to give this event the full attention it deserves. I merely wanted to give it some additional visibility and let potential attendees know what future conferences from COVAC [Coalition of Vegan Activists of Color] might look like. The atmosphere was very welcoming, the presentations excellent, and the messages more relevant than ever. 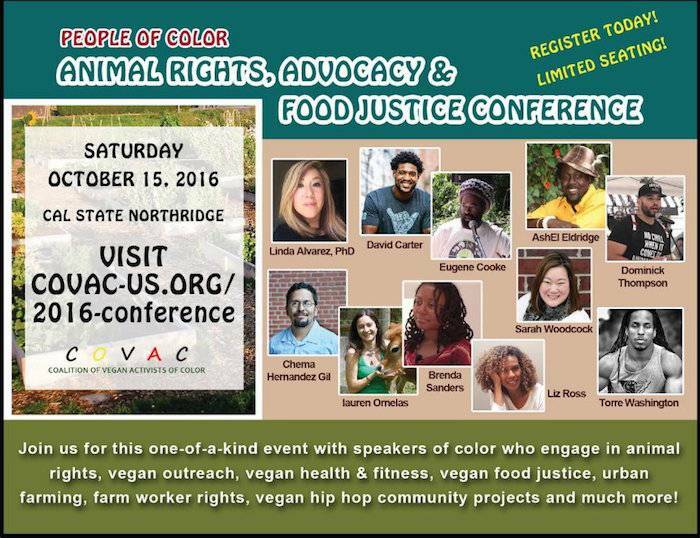 The event’s organizer, Coalition of Vegan Activists of Color (COVAC), billed this as a first-of-its-kind conference in Southern California, and considering how white-centric most vegan and animal rights events are, this is both sad and encouraging. One of the aspects of the conference I really appreciated was that all the presentations were consecutive, so attendees weren’t left having to decide between two or three speakers they really wanted to hear. Every speaker was a person of color, and the issues they addressed ranged from food as a tool to social change to the very language we use in our activism. The day was long and the presentations in-depth, so I won’t go into a deep dive here, but I will offer a brief summary of this important activism event. The day kicked off with a panel of three vegan athletes—former NFL defensive-end-turned-activist David Carter, professional bodybuilder Torre Washington, and triathlete Dominick Thompson—all of whom debunked many of the health myths surrounding veganism and spoke about the role compassion plays in their lives. Sarah Woodcock, founder of The Advocacy of Veganism Society, followed with an examination of what veganism means, and she discussed intersectionality, suggesting that one way to support the Black Lives Matter movement is to stop saying “All lives matter,” however well-intentioned you may be. Not surprisingly, this got an enthusiastic response from attendees. A presentation by Chema Hernández Gil of San Francisco Rising followed. Chema addressed how colonization has worsened the diet of Indigenous peoples in Mexico and Central America. He explained, for example, that corn tortillas are a heritage food for Meso-Americans, and that because of how tortillas were traditionally created by hand with limewater, they have been the main source of calcium. With tortilla production now industrialized, however, and corn coming from the U.S., this food is no longer as nutritious. Linda Alvarez, assistant professor in the Central American Studies Department at CSUN and a co-organizer of the conference, talked about her interviews with Central American workers in the U.S. food system. This was a deeply moving presentation, as many of the people she’s spoken with work in slaughterhouses. None of them enjoy this work, she said; they are only there because the violent conditions in their home countries forced them to flee to the United States. They are doing work few will do just so they can support their families. Linda characterized these people as refugees who left home in fear for their lives. I really enjoyed the next segment, presented by Brenda Sanders, executive director of Better Health, Better Life. Brenda—who is also the co-creator of Vegan SoulFest, an annual celebration of culture and the vegan lifestyle in Baltimore City—spoke about how white activists can be better allies to activists of color. One of the mistakes some activists make, she said, is to take their activism into a new community and try to tell members of that community what they should or should not be doing. You’re more likely to have success in your own community, she said, where you are known and trusted. She also stressed the importance of only using delicious food in your outreach. Brenda brought a lot of humor to her talk, which everyone appreciated. Next was a short documentary, Vegan Noir: Black Vegans in Los Angeles, which focuses on different perspectives of veganism via several Black vegans who live in Southern California. The film was followed by a panel discussion with the filmmaker, Toni Bell, and Liz Ross, who appears in the film and is founder of COVAC and co-organizer of the event. AshEL Seasunz Eldridge, founder of The Urban Farmacy and coordinator at Hip Hop Green Dinners – the 10th Element of Hip Hop in Oakland, brought his usual charm to the event. Hip hop performing artist, writer, emcee, music producer, teacher, and entrepreneur, AshEL is a multi-talented activist who began his presentation by chanting a beautiful Shinto purification prayer called Amatsu Norigoto. He talked about Kujichagulia (koo-jee-cha-goo-LEE-ah), which is one of the seven principles of Kwanzaa and celebrates African heritage. It’s about self-determination, he explained, and it creates a focus on creating solutions rather than complaining about what doesn’t work. “When we focus more on solutions than the problems, we are less distracted and frustrated and more confident and on path with our purpose,” he says. He also talked about the Hip Hop Green Dinners he helps organize, which blend entertainment with free vegan meals, and he showed his music video Food Fight, which attendees loved. The final presentation, called The Hood Food Movement, featured Eugene Cooke, veganic urban farmer and founder of Grow Where You Are. He gave a truly inspiring talk about the power of food and reconnecting with the environment. The soles on our shoes insulate us from the earth, he said, suggesting that we take the time to occasionally feel the grass under our feet and the resulting vibrations through our bodies. With photos from the Standing Rock pipeline protest behind him, he asked, “Why is Standing Rock so important? Because we aren’t doing it. They are. If we don’t value the land, we can forget about any movement we think we have.” Eugene said, “I got my mind blown and my heart washed” by all the amazing folks who came together at the event. Liz and Linda then took to the podium to say that each conference will recognize a leader in the activist community and honor them with an award. The inaugural honoree of this Leadership Award was lauren Ornelas, who in her thank-you speech spoke about the foundations of Food Empowerment Project and the importance of supporting grassroots groups. David Carter wrapped up the day with a very brief keynote, and then Linda and Liz ended the conference by saying they will be organizing another one—after a well-deserved rest. It is beyond the scope of this modest blog to give this event the full attention it deserves. I merely wanted to give it some additional visibility and let potential attendees know what future conferences from COVAC might look like. The atmosphere was very welcoming, the presentations excellent, and the messages more relevant than ever. Moreover, as a white activist with a lot to learn, I found this to be a great experience toward building more solidarity in our movement. If you have a chance to be part of their next conference, do try to make it. And... Food Empowerment Project could not be more proud of lauren Ornelas for winning the first Leadership Award at the Coalition of Vegan Activists of Color (COVAC) Animal Rights, Advocacy and Food Justice Conference in October. We know lauren is an inspiring leader in the movement making the world a better place for all living beings, so we're delighted her work has been recognized by such an extraordinary group. Please join us in congratulating lauren! Contact info here.